A commission that investigated last year's terror attack on the U.S. diplomatic compound in Benghazi, Libya, that killed four people lacked sufficient independence and did not hold senior officials accountable, a congressional report said on Monday. The independent review board was launched by then-Secretary of State Hillary Clinton and criticized the department for failing to provide adequate security. It singled out mid-level officials. But the new congressional report said the review board downplayed the importance of decision making at senior levels of the State Department. It also criticized the conclusion that pinned accountability for security issues on certain State Department officials "based on factors that had little or no connection to the security posture" at U.S. diplomatic facilities throughout Libya. "The haphazard decision to place the four officials cited by the (review board) on paid administrative leave created the appearance that former Secretary Hillary Clinton's decision to announce action against the individuals named in the (review board) report was more of a public relations strategy than a measured response to a tragedy," the committee's assessment said. Secretary of State John Kerry re-instated those employees, who were reassigned to other jobs. The new report also questioned why Under Secretary of State Patrick Kennedy, who still oversees diplomatic security at the State Department, was never disciplined or assigned responsibility. Moreover, the report is the closest congressional investigators have come to tying Clinton to aspects of planning for the Benghazi mission before the attack. The report said e-mails showed it is "likely Secretary Clinton's views played some role in the decision making" on the future of the mission while discussions within the State Department on the uncertain security picture in Libya were ongoing. In response, the State Department accused the report of "twisting the facts" in an effort to advance a political agenda. "The idea that facts are being hidden and people shielded from questioning is wrong on its face," State Department spokesman Douglas Frantz said in a statement. "State Department officials, including former Secretary of State Hillary Rodham Clinton, have appeared at nine congressional hearings and the Department has provided thousands of pages of material to members of Congress and their staffs," he added. Two accountability review Board members, former Ambassador Thomas Pickering and former Joint Chiefs Chairman Adm. Michael Mullen, are scheduled to testify before the Oversight panel later this week. Kennedy is scheduled to testify before a separate hearing this week before the House Foreign Affairs Committee. "The independent review board was launched by then-Secretary of State Hillary Clinton and criticized the department for failing to provide adequate security. It singled out mid-level officials." The witchhunt, started by the witch. Sort of like having Eric Holder starting the investigations on the DOJ. Obama and Clinton MUST be held accountable for the lies. We owe it to the families. What about the much bigger lies from Bush and Cheney? And not just about Iraq! Surely they knew something about the impending financial crisis about to hit us (and most of the world) as their terms in office were ending and said nothing! After Obama's inauguration, these clowns fled DC rapidly! "Transition" period? Didn't happen, these cowboys ran back to their ranches to hide out the storm! Can you imagine were we would be today if McCain had won, worse yet if Romney had won the White House? "The Great Depression" Act II !!!! VIEWPOINT DESDSE PHYSICAL TRANSMISSION ALL IS DONE IN VOTER MAGNETIC SPECTRUM. PROBHENIENTES OUR OWN FIELDS OF GENERATING ELECTROMAGNETIC FIELDS SINAPSIS EXTREMELY LOW. INCUBUS PROJECT – CIFI OR TRUE CNN. REMEMBER THE SMALLER TOWNS OF EU. AGENCIES IN THE AREA OF OPERATIONS BLACK, HAVE HUNDREDS AGENTS USING AGENTS IN ROOMS FOR HANDLING HUMAN SCIENTISTS WITH HARDWARE TECHNOLOGY WATCHING MONITORS 15 NEURO BRAIN ACTIVITY OF EACH SUBJECT. TECHNIQUE FOR WEEKS ARE PRODUCING STIMULUS INMOBILES CLEARING CELL GROUPS AND ENCOURAGING LAUGHS segregating TRANSMITTERS NEURO SLEEP WORK STRESS. THE VICTIM TO RESPOND TO INCENTIVES MAKING CHANGES LAST YEAR INCLUDING BIOLOGICAL NEURONAL SEPARATION OF AREAS FOR VARIOUS USES. Are you holding a copy of Catcher in the Rye right now ? This is news? This is common knowledge. Mistakes were made, a major one at the local level. This investigation is stupid partisan politics. History will eventually show this was not an attack on a "US consulate", but a bunch of anti-foreign jihadists attacking a small CIA outpost where there should have better security but was never set up to have VIP State Dept. personnel on the ground. Our nation faces many challenges, let's get on with them. bomb Syria, our nation is facing superpower credibility. I keep trying to make the same point! 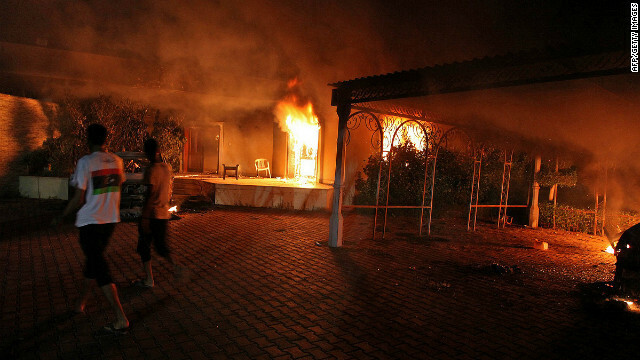 Stevens traveled to Benghazi from our protected embassy in Tripoli. Apparently he felt insecure and requested more protection, several times. When his requests were not granted, why the he11 did he remain in Benghazi, especially during the anniversary of 9/11??? Why not return to Tripoli, sort out the security issues then return when adequate security was in place? Another BIG unasked question: Why was Stevens in Benghazi? Was his mission so important? Something much bigger is behind all this, and nothing is being told. Benghazi was not a high security compound to begin with, why did we have a very important ambassador residing there? If you really want to "blame" someone, then blame Stevens. He should have known better! My personal opinion of Hillary as Sec. of State: Very poor! Her agenda was traveling all over the world and focusing on nothing. Her "reset" with Russia went nowhere! After delivering her "mislabeled button", the whole subject was dropped! Nothing accomplished, too busy flying around the world to devote any serious attention to her office! What the fk is wrong with us? Islamic terrorists attack us and kill ours, and we finish the job by trying to throw the rest of us under the buss. Wanna drop bombs? Here is a legit chance to do so. PS russia can go F herself after their words today. Putin f you. your vociferous swearing is only self demeaning. it accomplishes nothing whatsoever. please advise, how f'ing old are you? just f'ing curious. She's doing the old shuck and jive to keep her 2016 chances alive. Typical liberal democrat. I said "buck stops here" and if that's not enough, feel free to jump off the Washington monument. You dropped the ball on this one, but throwing our people under the buss to appease partisan politics is insane. She might go back now and consult her North Korean allies on how to continue. Might even yell across the ol' river to see how Putin's doin. Hillary dodged another one this time. QUEREMOS HACERLE UNA PREGUNTA POR QUE LOS DEMAS TEXTOS DESAPARECIERON Y LOS DE ESTA PAGINA NO. RECUERDEN 100.000 MIL NIÑLOS VENDIDOS PARA ESTALLARLES LOS ORGANOS POR LA REINA DE INGLATERRA, ESPAÑA, ALEMANIA, CANADA, SUIZA EMPRESAS FARMACEUTICAS. CNN WE WANT TO MAKE A QUESTION WHY THE PAGE DISAPPEARED AND OTHER TEXTS DONT. 100,000 THOUSAND CHILDREN REMEMBER ESTALLARLES BODIES FOR SALE BY THE QUEEN OF ENGLAND, SPAIN, GERMANY, THE VATICAN BENADICTO, CANADA, SWITZERLAND PHARMACEUTICAL COMPANIES.